Anxiety disorders, as a group, are the most common mental illness in America. More than 19 million American adults are affected by these debilitating illnesses each year. Children and adolescents can also develop anxiety disorders including, phobias, Panic Disorder, Obsessive Compulsive Disorder, Post Traumatic Stress Disorder and Generalized Anxiety Disorder. Most people experience feelings of anxiety before an important event such as a big exam, business presentation, or a first date. Anxiety disorders, however, are illnesses that fill people’s lives with overwhelming anxiety and fear that are chronic, unremitting, and can grow progressively worse. Tormented by panic attacks, obsessive thoughts, flashbacks of traumatic events, nightmares, or countless frightening physical symptoms, some people with anxiety disorders even become housebound. IMI works to alleviate these disorders through the use of virtual reality therapy. Virtual reality exposure therapy places the client in a computer-generated world where they “experience” the various stimuli related to their phobia. The client wears a head-mounted display with small TV monitors and stereo earphones to receive both visual and auditory cues. In careful, controlled stages, the client is exposed to experiences that elicit higher levels of anxiety. Each stage can be repeated until the client is comfortable with the experience and satisfied with their response. 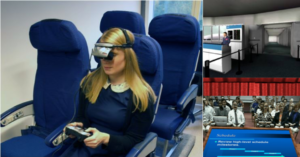 Future areas of research for IMI include the use of virtual reality to treat anxiety that develops with diagnosis of chronic and serious physical illness to improve overall quality of life for this population.